KABUL: An hours-long battle in the Afghan capital involving insurgent rocket attacks and military airstrikes ended Tuesday with the death of two militants, authorities said. The assault came as President Ashraf Ghani was making a speech marking the first day of the Eid al-Adha holiday, days after he offered the Taliban a conditional three-month ceasefire. “Two attackers were involved. 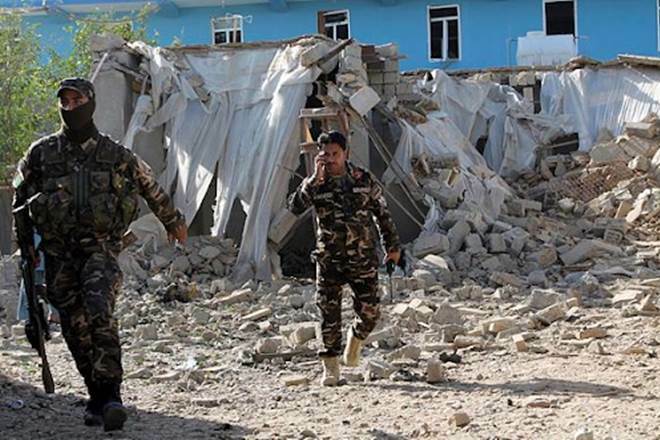 The enemy was firing mortars,” General Murad Ali Murad, commander of Kabul´s garrison, told a press conference. They were killed and at least six civilians or security force members were injured, he said. Police said the attackers used rockets, several of which landed in at least two areas of Kabul around 9:00 am. During the battle an Afghan army helicopter swooped in low near the Eidgah Mosque in a central district and fired a rocket at a militant position, sending a plume of dust into the sky. Blasts and gunfire could be heard as security forces cordoned off the area. Footage aired during the attack on Tolo News showed black smoke emanating from the area near the mosque while fire trucks and security vehicles rushed to the scene. Danish later told Tolo the militants were using rocket-propelled grenades and mortars to target parts of the city. “Choppers are flying over the site and the security forces are busy defusing two explosive-packed vehicles,” wrote interior ministry strategic communications chief Bahar Mehr on Facebook. Ghani unveiled the government’s latest ceasefire gambit during an Independence Day address late Sunday, saying security forces would observe the truce beginning this week — but only if the militants reciprocated. The Taliban did not immediately respond to Ghani’s proposal, but have vowed to release “hundreds” of “enemy prisoners” to mark the Eid holiday, which began in Afghanistan on Tuesday. Analysts were mixed over Ghani’s proposal, with some saying the government’s move was a sign of desperation after recent heavy bloodshed, while others said the trust-building measure was integral to paving the way for negotiations. The Pakistan Foreign Office in an official tweet condemned the attack and urged all parties to respond to Afghan government’s offer for a ceasefire. “Pakistan condemns rocket attacks on Kabul close to the presidential palace during Eid prayers and urges all parties to respond to the Afghan Government’s ceasefire offer,” Foreign Office spokesperson Dr Mohammad Faisal tweeted. “We are with the Afghan government and people in order to completely defeat this cowardly mindset,” he added. Meanwhile, Chief of Army Staff (COAS) General Qamar Javed Bajwa expressed deep concern on the recent rocket strikes in Afghanistan earlier on Tuesday morning and over the loss of precious innocent lives. However, General Bajwa emphasised that Afghanistan needs to look inward as the problem resides inside Afghanistan. “Thus, the solution thus remains on making substantive progress on Afghan reconciliation efforts as well as on the speedy implementation of Afghanistan Pakistan Action Plan for Peace and Stability (APAPPS),” he said.